For most of the 20th century Oklahoma’s state capitol remained “unfinished,” the majestic cast-in-place concrete dome its designers envisioned never built. But as Oklahoma approached its centennial – to be celebrated in 2007 – a new spotlight was trained on the incomplete structure, and efforts to construct the dome finally gained momentum. 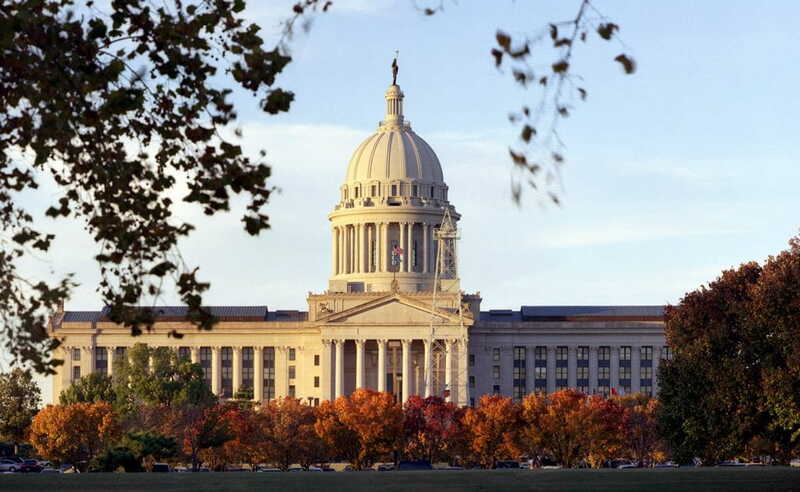 At long last Oklahomans would complete their state capitol – with one important distinction: the dome they would build in the 21st century would be constructed with a steel superstructure. By Gene O. Brown, P.E., and Timothy J. Dolf, P.E. Oklahoma became a state in 1907, and by means of a special session of the Oklahoma legislature and a statewide election on December 16, 1910, legislators and voters overwhelmingly chose to make Oklahoma City rather than Guthrie the capital. The Capitol Commission was formed to oversee the construction of the state capitol there. The noted architecture firm Solomon Layton and S. Wemyss Smith was selected to design the structure, and 8 acres (3.2 ha) of farmland several miles northeast of the downtown area were donated as the site of Oklahoma’s new government seat. The plans developed by the architects in 1914 favored a neoclassical design and called for the reinforced-concrete structure to be crowned with a 140 ft (42.7 m) cast-in-place concrete dome. Unfortunately, World War I had begun, and the money, labor, and materials needed to fully complete the structure were diverted to the war effort. As a stopgap solution, a saucer dome – a cast-in-place concrete dome that, viewed from the interior of the building, gave the appearance of a shallow dome – was put in place. Commission meeting minutes reveal, however, that commissioners considered the idea of construction the saucer dome from steel to facilitate later demolition. Ground was broken on July 14, 1914, and the state took occupancy of the building on June 30, 1917. The cost of construction had totaled just over $2 million. Backed by private donations, the Oklahoma Department of Central Services began to develop the project, the state’s first major design/build contract. The new dome was designed and engineered by Frankfurt-Short-Bruza Associates, P.C., an architecture, engineering, and planning firm located in Oklahoma City. The new dome was constructed by Capitol Dome Builders, a joint venture of Manhattan Construction Company and Flintco, Inc., both of Oklahoma City. Statehood Day – November 16, 2002 – was seen as a fitting date for the dedication ceremonies. The construction team determined that 19 months would be required for construction, which meant that construction had to begin by April 2001. Such a schedule allowed only six months for site investigation, architectural design, and engineering. The initial efforts of the design/build team were directed toward verifying the findings of the feasibility studies carried out before the fund-raising efforts. Thanks primarily to the Oklahoma Historical Society’s meticulous preservation of the original ink-on-linen construction drawings, project specifications, construction photographs, and Capitol Commission meeting minutes, this verification process was not as complicated as it might have been. Although the construction documents would be considered incomplete by today’s standards, they proved to be an invaluable resource during both the investigative phase and the design process. The original documents included just 1 structural drawing and 5 architectural drawings for the dome; by contrast, 71 drawings were required to fully develop and construct the dome. The capitol was constructed as a five-story, cast-in-place concrete frame on a spread footing foundation that incorporated approximately 13,000 cu yd (9,942 m) of hand-mixed concrete. A review of the historical documents revealed that while there were actually four different foundation plans, only three were included in the preserved set of drawings. The first two foundation plans were based upon the support of the saucer dome and the large dome and utilized an allowable bearing pressure of 4,500 psf (215.5 kPa). The third foundation plan was for the support of the saucer dome and took advantage of a revised allowable soil bearing pressure of 6,500 psf (311.2 kPa). Several exploratory studies were performed to determine which of these plans had actually been used in construction. By core drilling through the foundations and into the foundation bearing strata, laboratory testing was able to provide engineering data based upon modern testing procedures. Through strategic core drilling locations it was determined that each of the four central spread footings in the core area was 28 ft (8.5 m) wide, 38 ft (11.6 m) long, and approximately 5 ft (1.5 m) thick. Although the size of the footing did not correspond to any of the three preserved foundation drawings, the dimensions did appear to correspond to the expected size of the footing required to support the large dome with the increased allowable bearing value. The size of the footing helped establish that the engineering of the foundation had been based upon the higher bearing value and further indicated that the existing structure had a built-in allowance for the 140 ft (42.7 m) tall cast-in-place concrete dome. Moreover, the soil testing preformed on the bearing strata indicated that the allowable bearing value could have increased another 54 percent, to 10,000 psf (478.8 kPa). Additional documentation was found indicating that the structure was intended to support the large dome. Capitol Commission meeting minutes supported the exploratory testing results but by themselves did not provide proof, since no one could be sure that all of the minutes had been preserved. Capitol Commission minutes dated June 8, 1914, indicated that the contractor was “directed to furnish columns for supporting the dome in accordance with [the] design for the high dome.” The columns alluded to in the meeting minutes were the rotunda columns, which would support an octagonal “ring beam” 100 ft (30.5 m) above the basement level. This 5 ft (1.5 m) thick, 80 ft (24.4 m) diameter cast-in-place concrete ring beam was constructed to support the future dome framing. The physical dimensions of the rotunda columns and ring beam matched the drawings for the large dome. Historical photographs of the ring beam and columns taken during construction confirmed the total number and layout of the reinforcing bars shown in the original construction drawings for the large dome. Having confirmed the physical dimensions of the existing structure, the architects and engineers were able to begin designing the new dome. Their focus shifted to determining the existing structural design properties. The original construction specifications indicated the mix proportions for the concrete as “one part cement, two of sand, and four of rock” and stated that “all concrete that is reinforced is to be what is known as sloppy consistency – that is, so thin that it will run off the shovel if not handled rapidly.” The original specifications further stated that “concrete in footings and foundation walls is to be somewhat stiffer,” indicating less water in the concrete mix. To determine actual concrete comprehensive strengths, 4 in. (101.6 mm) diameter core samples were taken from numerous concrete beams, columns, and footings. Laboratory tests indicated that the compressive strengths were fairly consistent and averaged 1,610 psi (11,101 kPa) in the superstructure and 3,270 psi (22,547 kPa) in the foundations. The higher compressive strength in the footing was expected because typically less water is associated with higher concrete strength. Additionally, samples of the steel reinforcing bars were carefully removed from strategic locations. Steel reinforcing bars existed in various shapes, including square, twisted square, deformed round, and smooth round bars. Testing of the reinforcing steel consistently indicated a yield strength of 49,000 psi (337,855 kPa). Although the cast-in-place concrete compressive strengths were much lower than those seen today, the structural members were much more massive. The information gathered during the investigative stage provided strong evidence that the structure had indeed been designed for the anticipated loads associated with the large cast-in-place concrete dome. The team proceeded on this basis. One of the greatest challenges the construction of the dome presented, however, was the stipulation that the building remain fully operational during construction and that all historical documents and murals be protected from construction activities and the elements. The design/build team developed a construction plan that addressed the challenges by incorporating required construction sequences into the design of the dome. This incorporation would have been virtually impossible had the project been constructed in accordance with the conventional design/bid/build process. The design/build approach brought team members together early in the design process and helped them resolve constructability concerns long before problems arose. Although the existing structure is of cast-in-place concrete, the team determined that the new dome would be constructed with a steel frame. The decision to change structural systems was based upon a 60 percent reduction in weight as well as a reduction in constructability constraints. The weight of the new dome was a concern for several reasons, the most salient being the associated increase in seismic force. The new dome itself would comply with current seismic provisions; however the existing structure was not believed capable of resisting the potential seismic loads because it could not be retrofitted to meet seismic detailing requirements. Demolition of the cast-in-place concrete saucer dome removed approximately 2 million lb (907,200 kg) of original construction materials, and new construction added nearly 5 million lb (2.27 million kg). The 3 million (1.36 million kg) net increase meant an increase in the overall building weight of slightly more than 4 percent. Developing accurate wind pressures was a challenge because a hemisphere constructed above a colonnaded cylinder is not addressed in the building codes. Exterior columns, building features, and nearby structures further complicated matters. The team determined that wind tunnel testing would be prudent to validate the interpreted wind pressures. A wind tunnel consultant constructed a 1:175 scale model encompassing the entire capitol structure and all other structures within a 1,640 ft (500 m) radius. The model, complete with 88 pressure taps, was placed on a turntable so that pressures could be determined for wind coming from 16 different directions. Since testing was performed on a small scale, the actual air speed in the wind tunnel was reduced to 42 mph (67.6 km/h), and the resulting wind pressures were sampled over a period of 60 seconds. Multiple periods were then averaged to provide mean external pressure coefficients based upon elevation and azimuth with respect to the wind direction. The wind tunnel testing also provided the maximum inward and outward external pressures for use in designing the dome’s components and cladding. Although wind tunnel testing indicated wind pressures lower than those interpreted from the building codes, it was decided to use the building code pressures during design. In addition to lateral loads, several types of gravity loads were considered. Preliminary calculations indicated that snow, ice, and code-prescribed roof live would not significantly control the design of the final structure. Through meetings and conversations on constructability issues, construction sequences and the associated imposed loads were elevated. Since the new dome did not have any elevated floors on which work could be staged, two temporary platforms were designed to support scaffolding, demolition debris, and construction materials. The lower work platform was built with conventional scaffolding supported at the fourth floor of the existing structure and was decked with plywood. This platform facilitated demolition of the saucer dome down to the ring beam level and protected the occupied area below from the demolition debris. Isolated demolition of the concrete saucer dome was performed so that the steel columns that would form the new dome’s colonnade could be installed. The upper work platform was then supported above the saucer dome and attached to these columns. The 16 radial beams supporting the upper work platform were placed so as to project through the 16 future window openings. Since the windows could be installed later in the construction schedule, the work platform could remain in place during much of the construction process. The upper work platform was approximately 110 ft (33.5 m) square in plan and was designed to support a 50 psf (2.39 kPa) live load. The platform was constructed with a waterproofing membrane sandwiched between two 2 in. (50.0 mm) thick concrete slabs reinforced with polypropylene fiber. Scaffolding was set along the perimeter of this platform to finish erecting the structural steel frame and the precast-concrete and cast stone veneer. Hatches were constructed in the upper work platform to remove demolition debris from below and lower construction materials from above. Portions of this platform could then be removed in stages to allow the drum of the dome to be constructed through the platform. Eventually, each of the radial beams was removed through the window openings and the scaffolding from the lower platform was extended upward so that construction of the inner dome could proceed. The need to protect the building, its occupants, and the valuable artwork dictated much of the construction sequencing and required the use of temporary weather-resistant enclosures. To protect the interior artwork from moisture, a temporary structure was built from the upper work platform down to the existing roof, 26 ft (7.9 m) below. The weather-resistant structure was sealed around the new dome columns and remained until the dome was substantially complete and weatherproof. The temporary enclosure appeared as a white metal box covering the lower portion of the drum. From the construction sequencing required for the work platforms and scaffolding, the team determined that the governing gravity load case would be the construction loads and the potential for additional ice to accumulate on the scaffolding during the winter. The scaffolding itself weighed 120,000 lb (54,432 kg), and that weight would then be equaled by the weight of the construction materials that would be staged on the platforms. By working with the contractor’s construction requirements and sequencing, engineers determined realistic construction loads and incorporated them into the structural design of the dome. This incorporation of the construction requirements was facilitated by the design/build process, and the preplanning efforts undertaken by members of the design/build team reduced the cost of construction. The plans for the new dome called for an outer dome of precast concrete and cast stone, a structural steel frame, and an inner, coffered dome of glass-fiber-reinforced plaster panels. The dome would be 80 ft (24.4 m) in diameter and rise 140 ft (42.7 m) above the existing roof, and the lantern would be capped with a 17 ft (5.2 m) tall, 6,000 lb (2,722 kg) bronze statue of a Native American entitled The Guardian. Spiral staircases, catwalks, and ladders would provide internal access all the way to the cupola level at the base of the lantern, where anchors were provided for exterior maintenance. At the inner dome, certain coffers are removable and contain hoists to aid in such interior maintenance as cleaning and lightbulb replacement. Additional project elements included a state-of-the-art dome lighting system that can be adjusted to produce infinite color variations and a supplemental system by which smoke can be removed from all parts of the building through the oculus of the inner dome. Much of the structural framing was dictated by the dome’s architectural features. The dome’s proportions and the number of exterior columns and exterior windows were fixed on the basis of the five architectural sheets provided in the original construction documents. Every attempt was made to adhere to the intent of the original plans; however, modern construction techniques dictated numerous changes. The selected framing scheme consisted of an interior ring of 16 W14x176 (W360x262) wide-flange columns that are vertically braced above and below the windows in the drum. The exterior ring consists of 16 pairs of 12 in. (305 mm) diameter pipe columns, which are wrapped in precast concrete and form the colonnade. At the top of the columns a concrete-on-steel deck platform forms the oculus of the interior dome and serves as the tension ring and diaphragm at the base of the exterior dome. Sixteen arched W10x49 (W250x73) wide-flange columns extend from this platform to form the dome and tie in at the compression ring located just below the lantern at the cupola level. A 20 ft (6.1 m) tall, 36 in. (914 mm) diameter steel pipe with a cap plate extends upward through the lantern to support the base of the statue. This steel pipe was fitted with interior ladder rungs so that a worker could climb into the pipe and tighten the bolts that anchor the statue when it was raised to its final position, which occurred on June 7, 2002. The new structural frame was designed and the original cast-in-place central core was verified with the aid of three-dimensional structural modeling software. Owing to the complexity of construction and the construction loads imposed, several three-dimensional models were developed to depict the structure at various critical stages of construction. These computer models incorporated concrete members for the existing frame, steel members for the new frame, and finite elements for the verification of the existing foundation and ring beam. The final model contained 1,704 joints, 2,389 elements and members, and 452 spring supports. The three-dimensional model was simplified by utilizing the biaxial symmetry of the structure whenever possible. In addition, much of the member and joint input was simplified by importing digital exchange format (DXF) files from the computer-aided drafting software. A P-Delta analysis was performed, and since the number of load combinations was kept to a minimum, the computer’s required calculation time was not significantly increased. The structural modeling software was used to design the structural steel frame; however, it was not used to verify the capacity of the existing concrete structure. Governing force envelopes were determined for the existing concrete members and compared with their capacities as determined by hand calculations. Determining the capacity of the existing members was yet another of the many challenges encountered while verifying the adequacy of the existing structure. Rebar scanning equipment was unable to verify the amount of reinforcing steel in the concrete slabs and beams. The available construction photographs, although limited in number, indicated that construction had adhered to the original construction documents. Additionally, the photographs provided evidence that a portion of each floor had been load tested to 200 percent of the design loads. While checking the existing rotunda columns, which would support the new dome, the team determined that they contained two independent circular rebar cages that had been cast together side by side in a single rectangular column. Many hours were spent rationalizing the true axial capacity of such a detail. Fortunately, when it was determined that the column could be treated as two independent columns, it was found that the existing columns would provide adequate capacity for the dome. The maximum story drift was limited to the height divided by 300 and was governed by the drum section of the dome. Since X-bracing would have conflicted with the windows and further complicated the framing, a partial-height curved concrete shear wall was added to help stiffen the lower portions of the columns forming the drum of the dome. The final structural models and calculations indicated that the dome’s horizontal drift would be approximately 1.6 in. (40.6 mm) under a design seismic event and 1.4 in. (35.6 mm) under the design wind loads. To preserve the strength of the existing concrete ring beam, it was imperative that existing rebar not be cut during the installation of anchor bolts for the new columns. By locally chipping down to the top mat of existing reinforcement and drilling small pilot holes to locate existing lower mats of reinforcement, acceptable anchor bolt locations could be determined for the 352 anchor bolts. Templates for each anchor bolt pattern were created, and 48 unique base plates were fabricated and field welded to the columns. Aside from the beginning challenges involved in renovating an 87-year-old structure, the team encountered challenges associated with the finish materials. The existing structure was wrapped in limestone from a quarry no longer in production. In addition, the limestone was weathered and would have been very difficult to match with natural materials. Concerned that the construction cost would exceed the budget and that the limestone would not match, the team opted for architectural precast concrete and cast stone for the dome’s exterior. Several concrete samples were produced – in varying colors and with varying degrees of sandblasting – from which the final mix design was selected. To address concerns regarding the required maintenance of the sealed precast panel joints, a detail was developed through coordination with the fabricator of the precast-concrete panels in which precast ribs were placed over the vertical joints of the dome panels. As an added precaution, all inside faces of the precast panels would be accessible. This accessibility would help prevent damage to the original artwork and inner dome below from undetectable leaks. It would also facilitate repairs to the inner face of the outer dome. The precast-concrete panels were attached to the steel ribs at the quarter points of the panels, with the top and bottom ends left unsupported. Attachment was made with stainless steel pipes and plates. Since only half of a panel’s expansion or contraction would be restrained between the outermost pipe connections, this connection method and layout helped reduce the forces applied to the steel frame when subjected to thermal loads. Approximately 4,500 pieces of precast concrete and cast stone – totalling 1,700 tons (1,542.2 Mg) – were erected in levels, the first visible construction starting at the base of the dome. As soon as each level was completed, the scaffolding would rise to support the next level of construction. This staging continued until the base of the statue was reached.Instrumental in the success of the project was the tallest freestanding tower crane ever erected in Oklahoma. The crane’s hook could be raised 270 ft (82.3 m) above the ground and had a reach of 230 ft (70.1 m) – past the farthest extremity of the dome. The most significant load during construction was the placement of a 10,000 lb (4,536 kg) piece of precast concrete at the far side of the dome, 180 ft (54.9 m) from the tower. The crane boom deflected downward approximately 4 ft (1.2 m) during the lift. The crane’s foundation consisted of 5 ft (1.5 m) wide by 8 ft (2.4 m) thick concrete beams supported by four 48 in. (1,219 mm) diameter drilled piers that were spaced 22 ft (6.7 m) apart. The piers were embedded more than 25 ft (7.6 m) into the hard shale bedrock to resist design uplift loads expected to exceed 300,000 lb (136,080 kg). Thousands of Oklahomans convened to dedicate the new dome on Oklahoma’s Statehood Day, November 16, 2002. The project was completed on time and within budget and was dedicated with a spectacular show that culminated in a fireworks display unlike anything ever witnessed in Oklahoma. Today the dome stands tall in Oklahoma City and is a symbol of the pride that Oklahomans take in, as the former governor put it, completing what they start. Gene O. Brown, P.E., and Timothy J. Dolf, P.E., are project structural engineers for Frankfurt-Short-Bruza Associates, P.C., in Oklahoma City. For additional information on the dome project, visit www.oklahomadome.com.